The European Union and Armenia have agreed on a new pact tightening political ties, more than three years after Yerevan walked away from a more far-reaching political and commercial deal with the EU to join the Russian-led Eurasian Economic Union. 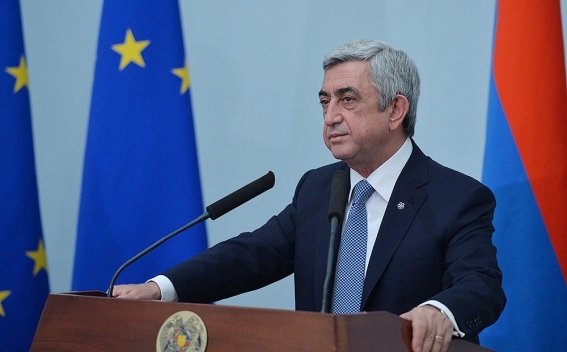 Talks on the agreement concluded during a visit to Brussels by Armenian President Serzh Sarkisian on February 27. It is expected to be signed later this year, possibly in May. Armenia negotiated an Association Agreement that included a free-trade deal with the EU in 2013, only to make a U-turn that same year and reject it under pressure from Moscow. The negotiations on a new agreement with the EU started in December 2015. It is less ambitious than the agreement that was abandoned in 2013, most notably lacking a free trade area component — which Georgia, Moldova, and Ukraine now have as part of their agreements with the EU. But it will upgrade political relations between Brussels and Yerevan, which are currently based on a Partnership and Cooperation agreement that entered into force in 1999. Armenia’s fierce rival, Azerbaijan, started talks on a new political agreement with the EU earlier this month.